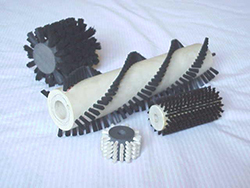 We manufacture custom or special brushes to your specifications, for commercial and industrial applications. We often work with engineers, assisting them in the design of the proper brush for a particular requirement. These brushes are commonly used on conveyors, machinery or on any area or part that requires a special tool. Our brushes are generally used for cleaning or debris removal, but may also be used for controlling the flow of material. They might be hand held or mechanized. We do not make “standard or common” brushes, such as, push brooms, hair brushes, paint brushes, or toothbrushes. These brushes are produced hundreds or thousands at a time. We specialize in production runs of one brush to several thousands. Tell us about your brush requirement and we will be happy to be of assistance in designing the proper brush. 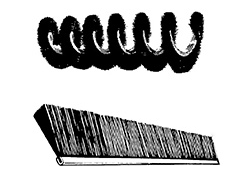 Staple set brushes are available in two basic styles; cylinder (roller) and flat block. A hole is drilled into a block, bristles are inserted into the hole and held in place by a tiny metal staple at the bottom of the hole. The block may be made of plastic, wood or metal. The blocks may be round or flat and in a wide variety of shapes, patterns, curves and sizes. Brushes can be made many ways. To the right are a few of the most popular styles of custom made brushes. 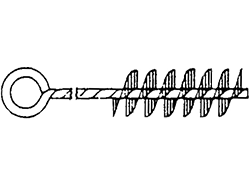 Twisted brushes are made by twisting two or more wires together in a spiral, with brush bristles in between. 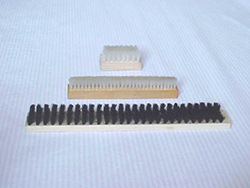 Metal back brushes are available in straight strips and coiled.